The absolute best caramel corn! Every piece is sweet, a little salty and perfectly crispy. In a medium saucepan combine the butter, sugar, light corn syrup, and salt. Melt slowly over medium heat, stirring constantly. When mixture comes to a full boil, stir constantly to prevent burning for 5 minutes. After caramel mixture boils for 5 minutes, remove from heat and add the baking soda. Mix in baking soda carefully as the mixture will expand when you add it. Pour caramel over popcorn and mix well to coat the popped kernels. 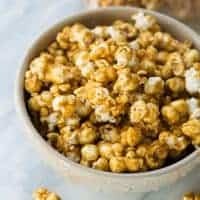 Place in glass oven-safe bowls or on parchment-lined baking sheets and cook the caramel corn for 1 hour, stirring every 15 minutes. Remove from oven and pour onto parchment-lined sheet trays immediately. Cool and enjoy!